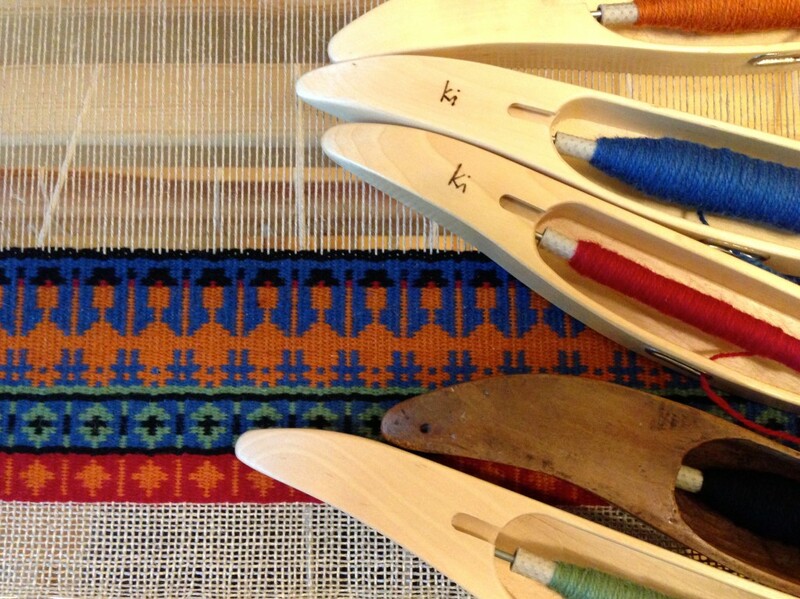 Loved ones are filling my home this week, so why not include them in weaving endeavors? My son Daniel took the challenge to create a Thanksgiving image on graph paper that I could weave in Bound Rosepath. A turkey pilgrim! Five shuttles carry the colors of Brage wool yarn for this bound rosepath weave on a 16/3 linen warp. Look at the orange to see the turkey pilgrims with black hats. Give thanks. Pilgrims, turkeys, families, generations of freedom. The American story handed down through the ages. Give thanks for the food. Give thanks for the blessings. Give thanks for your family coming together from near and far. Give thanks to your family. Give thanks to your friends. But above all, oh, give thanks to our creator, for he is good; for his love goes on and on and on without end. May your thankful heart ring with joy. Love the Thanksgiving pattern and the reminder to be thankful! I’m hoping to get a few more interesting designs from this houseful of creative people! Bound Rosepath – More Yarn and Time, Please!